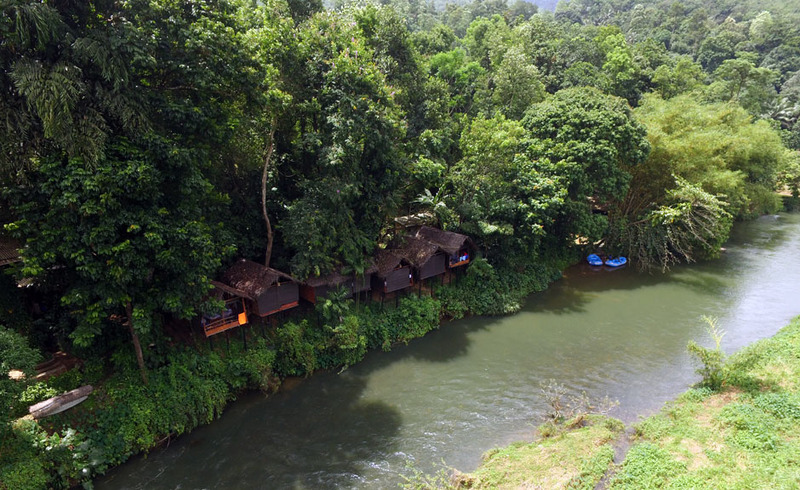 Situated on a hill overlooking the Kelani River, our camp combines the best aspects of outdoor camping and travel for those who need a certain degree of comfort. 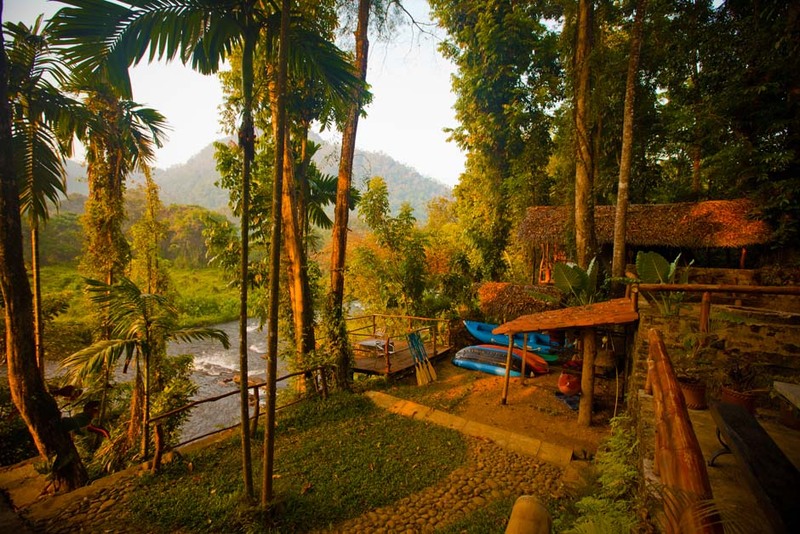 Surrounded by mountains and the clear, rushing Kelani below, our site is truly stunning. It is rustic and natural, perfect for those looking for a refined camping holiday. 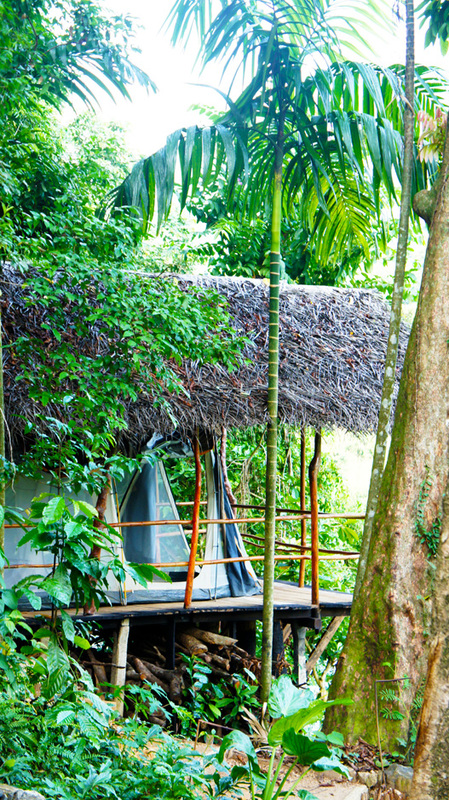 All our riverfront tents and cabins are covered by thatched roofs, ensuring a dry stay at all times. Your comfortable tents and cabins feature twin beds (which can be converted into double beds), quality linen, bedside tables and lamps, as well as a private terrace with spectacular views overlooking the Kelani. 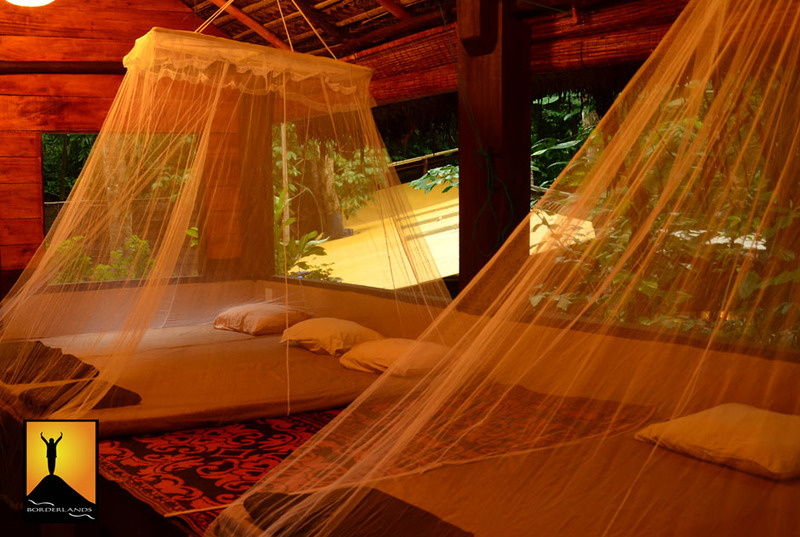 All our cabins also have mosquito nets. Our cabins are ideal for families and will sleep a families of between three to five. 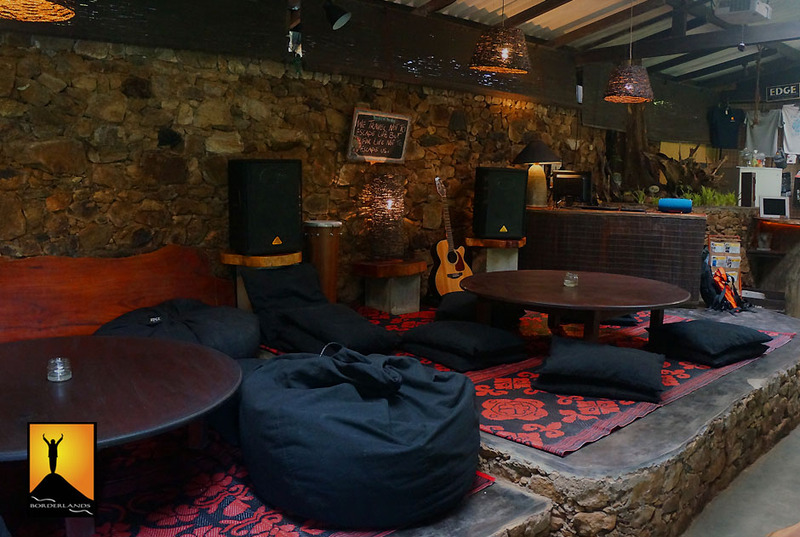 In the evenings guests gravitate to our Long House with its sound system, informal bar and comfortable cushioned seating area. 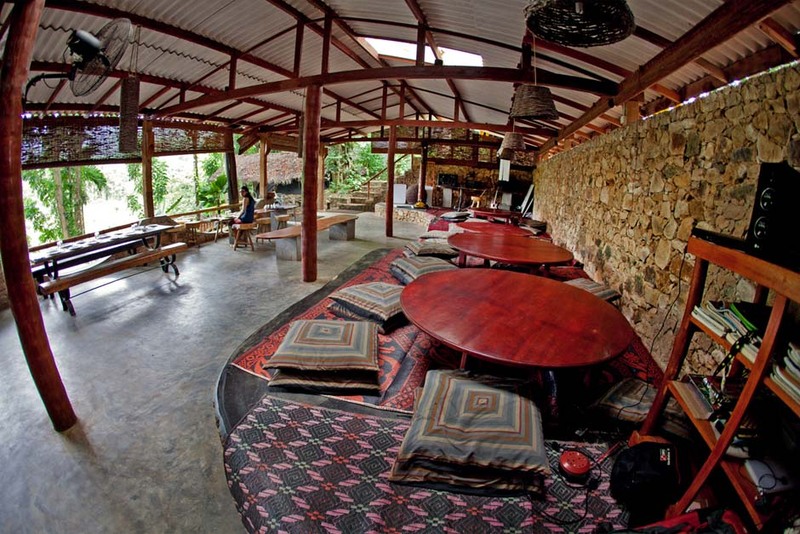 The Long House is fully wi-fi’d so you can share your adventures with friends anywhere in the world. Enjoy delicious food, a cold beer and great company with new found friends in a completely chilled environment. We have a deck overlooking the river as well as a place for a campfire, where you can unwind by roasting marshmallows. 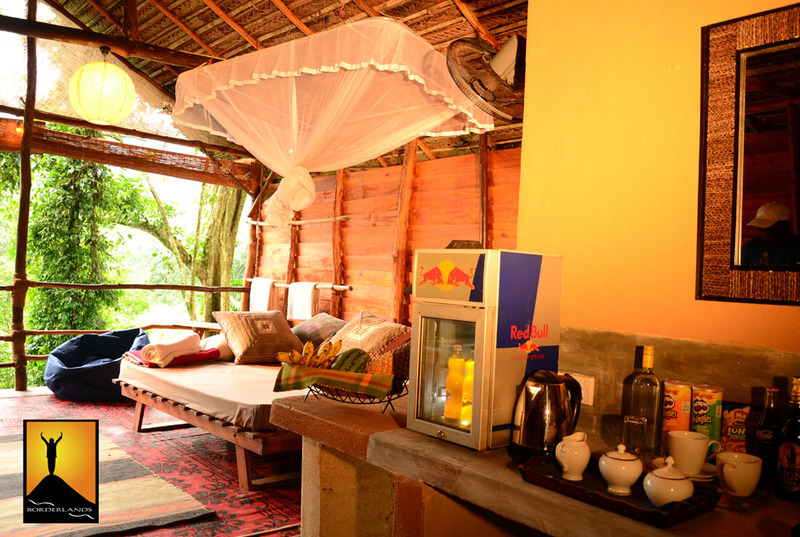 We hope you enjoy your stay and our lovely accommodations in this lush, wooded spot in Sri Lanka. We are confident that you will leave having fallen in love with Borderlands! The Long House features a bar, a “chill out” area for rest after a hard day of fun and a kitchen where Chef Bandula cooks up a delicious selection of Sri Lankan rice and curries, often hailed as the best guests have tried while in Sri Lanka, as well as some more western dishes for those who want a break from curry and rice. Meals can be adapted for guests with dietary restrictions and allergies. The Long House is fully wifi’d and is free of charge. There are a few power points in the Long House, but as a rule we ask that you charge any electronics in your tents. The Long House also has a great sound system so you can attach your iPod so you can listen to your music, but please be considerate to other guests we may have at camp when choosing music! Free filtered water is available in the Long House throughout your stay. All our tents have proper wooden frame beds with mattresses, lights both inside and outside. 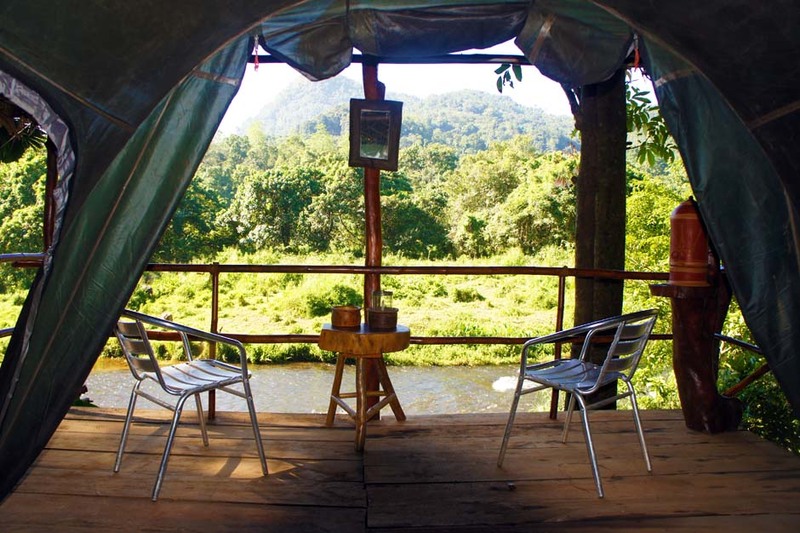 Each tent has a thatched roof over it and a terrace from which you can view the river and the surrounding mountains. Our tents zip completely secure so you can have total privacy, and our wood cabins, whilst can open on three sides during the day, have blinds which come down and offer complete privacy. Each cabin has a private, secured entrance. There is no need to bring towels as you will be provided with one during your stay. All accommodation has power points to charge electrical items such as laptops, phones and cameras. We do not have en suite bathroom facilities, but our bathroom block is separated into male and female facilities. Our showers are hot water showers. The water is safe for brushing teeth but do not drink the water, as it is not treated. A refreshing alternative to a shower is a river bath, and where possible please bring biodegradable products to help us protect our shared environment. We keep all of our watersports equipment on site so that we can maintain our equipment properly. As well as kayaks and rafts, we have all our safety equipment on site, including life jackets, paddling jackets and helmets on hand for all ages and sizes. Borderlands has a car park, so if you come with a driver you will have a safe place for the car. Please let us know if you have any requests, and we will be happy to fulfill them. Kithulgala is a small town in the Sri Lankan hill country on the road between Colombo and Hatton. It is does not hold much of interest outside a few local shops, a village temple and some short-eats eateries. The area is sparsely populated and dominated by a series of small mountains; these are especially impressive once you are on the water. The surrounding land is lush, peaceful and verdant, dotted with numerous tea estates that climb and wind up the hillsides. Rubber plantations abound on the lower elevations. 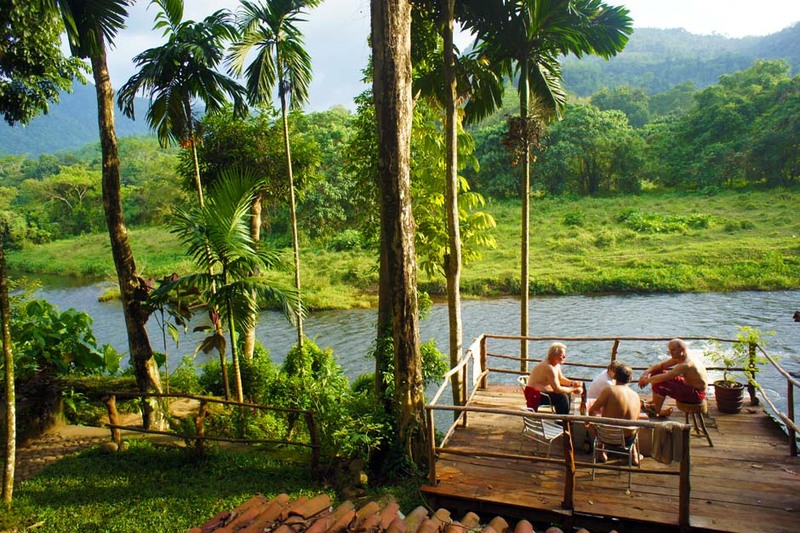 For those desiring a bit of nature, there are few places better than Kithulgala. 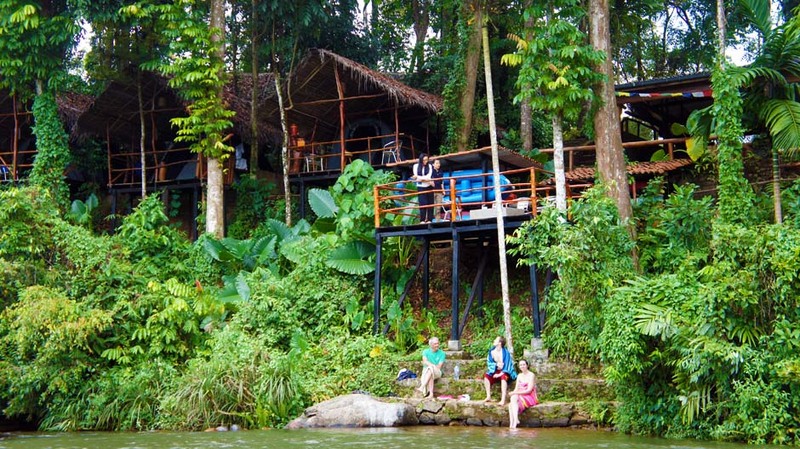 We offer guided hiking trips to the nearby Makandawa Rainforest Reserve. Additionally, there are several waterfalls and swimming holes in the vicinity which can be visited by foot, bike or car. The region has an abundant and diverse set of flora and fauna. Wildlife ranges from small reptiles such as lizards, chameleons and geckos to mammals such at the gorgeous giant squirrels which often frequest our camp. Avid bird watchers will enjoy the region as it hosts many endemic species such as the Sri Lanka Spurfowl, Green-billed Coucal and the Spot-winged Thrush, as well as the recently discovered Serendib Scobs Owl. Other tourist attractions in region include the cool and misty tea plantations the Hill Country – streching from Hatton all the way to Nuwara Eliya, all easily accessible by the famous hill train. The imposing Adam’s Peak, one of Sri Lanka’s holiest sites and pilgrimage site for thousands upon thousands of locals each year who make the ascent to witness sunrise on the summit. The city of Kandy (a UNESCO World Heritage Site) is a 2 hour drive and is the site for the famous Temple of the Tooth, and the beautiful Peradeniya Botanical Gardens. Within a day’s drive are the Ancient cities and UNESCO World Heritage Sites of Anuradhapura, Polonnaruwa and Sigiriya, and the Cave Temples at Dambulla. The Kelani river has significant film history associated with it. The Oscar Award winning movie, The Bridge on the River Kwai, used the river as its primary filming location. Monsoons affect the river’s characteristics, increasing the volume and strength of the Kelani, as well as the many dams upstream which control the water flow. The main wet season in Kithulgala is May through to early July, as well as October and November. You can find the most extreme rafting during and just after monsoon season. Special rates are available for Sri Lankan residents.